Secretary of State Hillary Clinton squandered an opportunity for the U.S. to gain a treasure trove of intelligence on China when she turned a high-level Chinese defector over to Beijing, a report said. In 2012, Clinton turned away Wang Lijun, a police chief and close aide to an up and coming regional Communist Party leader, after he had sought political asylum in a U.S. consulate in southwestern China, according to a report by Bill Gertz in the Washington Free Beacon. “Instead of sheltering Wang and granting him political asylum, Clinton agreed to turn him over to Chinese authorities in Beijing, and claimed he was not qualified for American sanctuary because of his past role as a police chief accused of corruption,” the report said. “Wang would have been pure gold from an intelligence standpoint, given the paucity of sources inside the Chinese government,” said Kenneth E. deGraffenreid, a former White House intelligence director under President Reagan. In her 2014 memoir “Hard Choices”, Clinton defended her betrayal of Wang, saying the U.S. government agreed to keep secret all details of the defection in order to help the Communists in Beijing “avoid public embarrassment over a major internal power struggle and high-level corruption scandal months ahead of then-Chinese leader Hu Jintao’s transfer of power to current supreme leader Xi Jinping,” the report said. Wang, who was charged with “defection” and other crimes, was sentenced to 15 years in prison in September 2012. 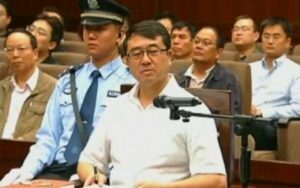 He was said to have been given a lighter sentence than expected due to information he disclosed about his boss, regional Communist Party chief Bo Xilai, a rising leader who was later imprisoned for corruption. Bo was a member of China’s 25-member Politburo Central Committee, a former commerce minister, and former mayor of the northern city of Dalian. He was said to be on track to become part of the nine-member Politburo Standing Committee, the collective dictatorship that is the ultimate authority in China. According to Gertz’s report, Wang revealed that Bo and his wife, like most senior Communist Party leaders, had amassed illicit fortunes through corruption. However, most details involved the murder of the British businessman, expatriate Neil Haywood, who was involved in financial activities related to Bo and his family and ran afoul of Bo’s wife. “The stuff he revealed was lurid,” said one former official close to the case. Clinton sought to portray Wang as corrupt, thuggish, and brutal, an assessment analysts say could be applied to most Chinese police and security officials. The U.S. Embassy in Beijing in 1989 harbored Chinese dissident Fang Lizhui for over a year when the astrophysicist took refuge there after the military crackdown on unarmed protesters in Tiananmen Square. But a State Department document from 2010 contradicts her assertion, the report said. The document, labeled “secret,” outlines in detail how officials at U.S. diplomatic outposts should handle foreign nationals who seek to defect. The foreign nationals are called “walk-ins” and can provide valuable intelligence. Clinton is touting her performance as secretary of state in her campaign for the presidency, but critics say her mishandling of the Wang defection raises serious questions about her handling of China issues and national security affairs. Recently disclosed emails from Clinton’s private server reveal the Wang defection was discussed in communications with aides, raising the possibility that the Chinese could have learned of her internal discussions of the case if they had obtained access to the email server, Gertz reported. “The FBI did find that hostile foreign actors successfully gained access to the personal email accounts of individuals with whom Clinton was in regular contact and, in doing so, obtained emails sent to or received by Clinton on her personal account,” an FBI report states. Had the defection remained secret, intelligence agencies could have conducted a clandestine “exfiltration” operation to spirit Wang out of the country, current and former intelligence officials said.